Ahh, fall is in the air! And by “ahh”, I mean “crap, it’s getting cold”. But even thought I don’t really like the cold, I DO like fall fashion! The boots, the blazers, the cardigans, the jackets, the hats, ALL of it. Sheath dresses are definitely in for all, and the belt will create an hourglass silhouette. 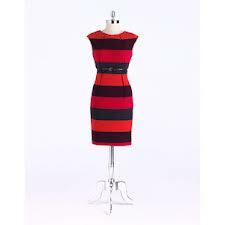 A striped sheath dress will also add dimension to your figure. Rock those curves, girl! A v-neck flatters your silhouette, while the sweater material will show off your shape. Plus, you’ll be warm AND stylish. Graphic sweaters are a major trend, and a great pattern or theme will create volume on the upper half of your silhouette, evening it out. Also – they’re fun! 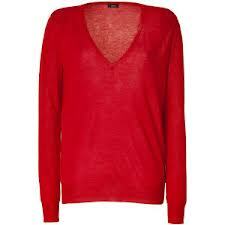 The V-neck neckline is the most flattering for rounder shapes, although a cowl neck is another good option! Cashmere sweaters never go out of style, and you can pick one in a great fall shade like red or oxblood. Printed pants were HUGE this summer, and the trend is continuing into the cooler months. Pair these with a simple top to draw attention to your legs. Be sure to pick a “fall-appropriate” print like the one shown above. Well, hope this helps! Happy fall shopping, ladies! What’s YOUR fall must-have? Let us know in the comments. 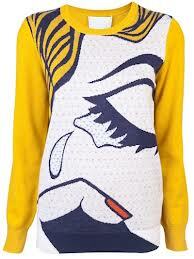 I love that Phillip Lim sweater!! !